On the left, a great poster for a music festival in Poland – we think both Daft Punk and the Russian Police Choir would like. Well, Daft Punk for sure, the Russians… maybe not so much. Like the guy in the back row – he definitely wouldn’t like the poster. At all. In Britain between 1871-1896, two men, known as Gilbert and Sullivan, were able to combine music, politics, parody and theater to great comic effect in theatrical operettas. Gilbert, who wrote the words, created fanciful “topsy-turvy” worlds where each absurdity is taken to its logical conclusion: fairies rub elbows with British lords, flirting is a capital offence, gondolliers ascend to the monarchy, and pirates turn out to be noblemen who have gone wrong. The operas also influenced political discourse, litterature, film and television and have been widely parodied. I love our G+S posters! 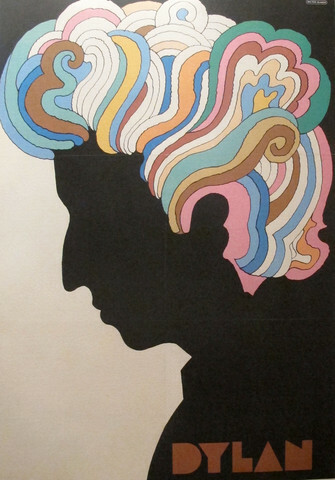 Classic Milton Glaser/ Bob Dylan poster from the late 1960s. Music has the power to transport, to oppose, and to change… and occasionally, to accomplish all that at the same time. Who would have thought that the Russian Police had the media savvy, the chutzpah and the ability to “Get Lucky?” (In case you are interested, they also do a pretty good rendition of Adele’s Skyfall. Previous Elizabeth Taylor, Hugh Jackman, Champagne and Chocolates – Or, what we think of on Valentine’s Day.